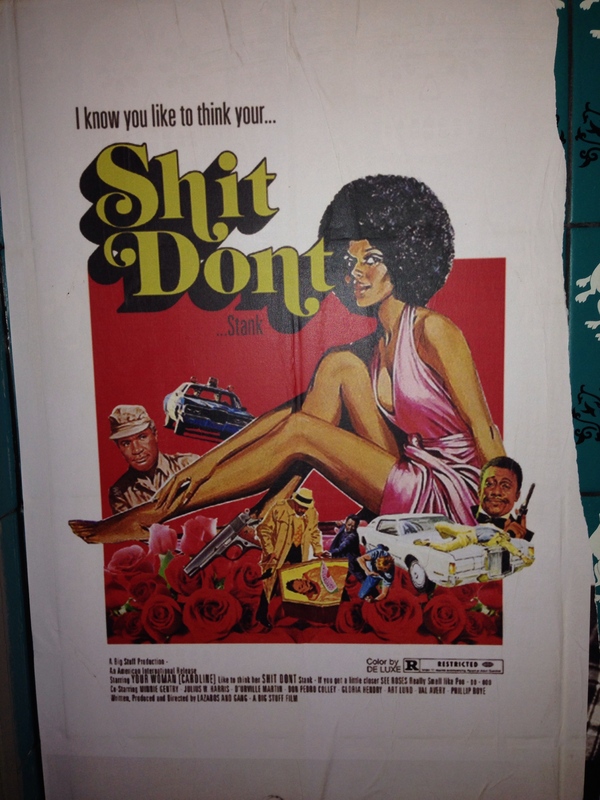 Mr. Big Stuff is hidden down Meyers Place, just past the Waiters’ Club. The door makes it look like it’s not open: it probably is. With a canteen, almost Wagamama-like, feel about the place, Mr. Big Stuff plays decent funky music and offers what they call soul food. Inspired by America’s deep south, there’s nothing real healthy-like about the menu, but it’s fun. If there are pigs ears on the menu, then I’ll have them. 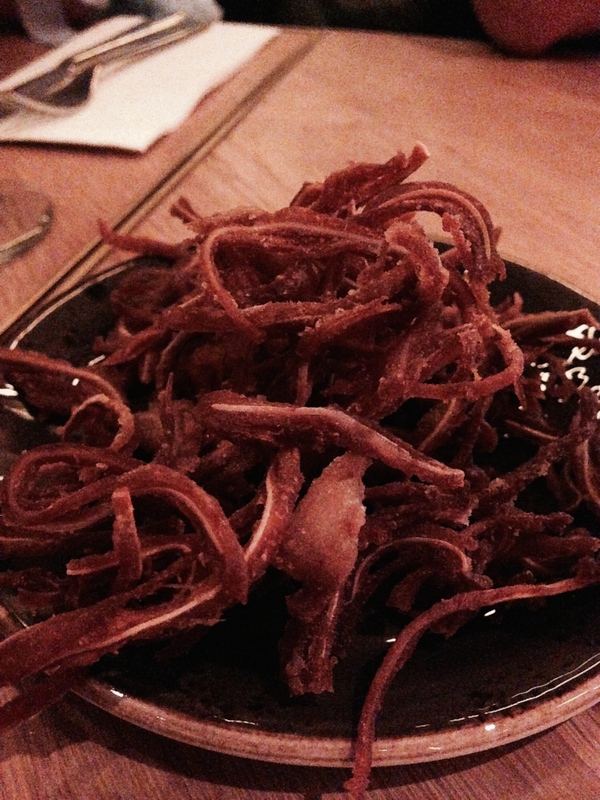 Finely chopped and deep-fried, these pigs ears were worth the trip in themselves. 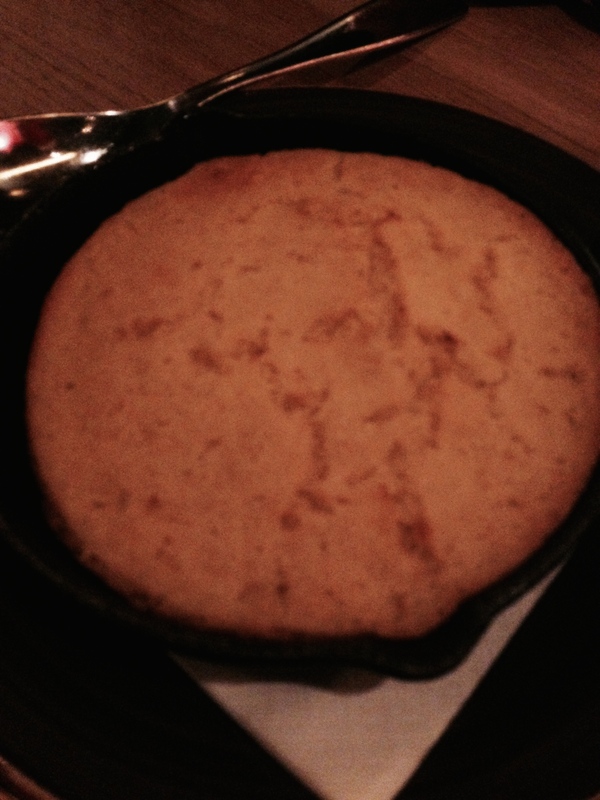 The corn bread was prettily served in a little skillet, but you know what? Corn bread is always disappointing to me. 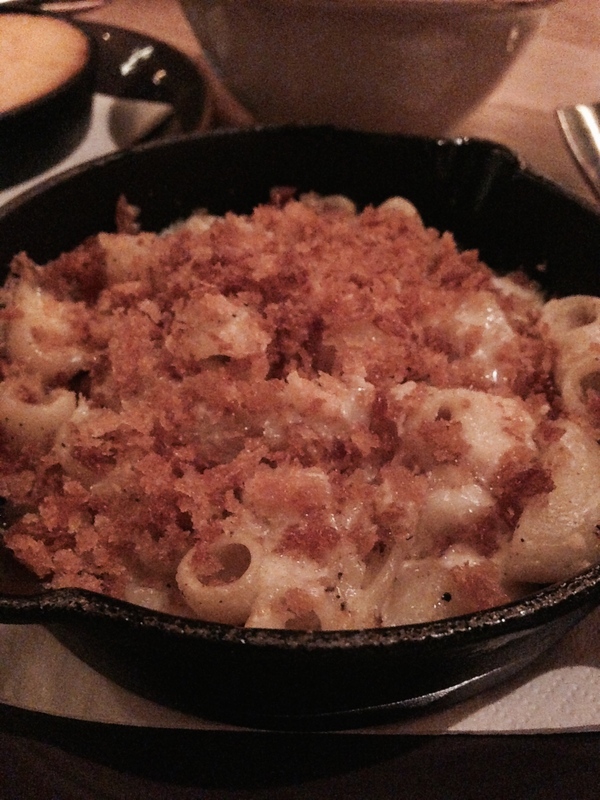 The macaroni cheese was similarly dished up, but my own macaroni pie is pretty good and I wasn’t about to pay for an inferior product. My dining companion said it was pretty tasty though. 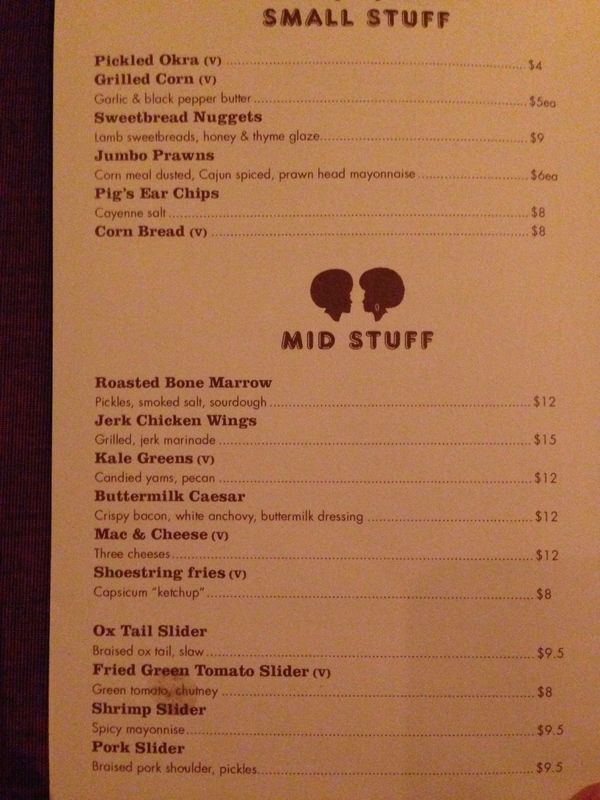 Again, I’d never order jerk chicken in a restaurant when I know I can get the best in Melbourne at home. 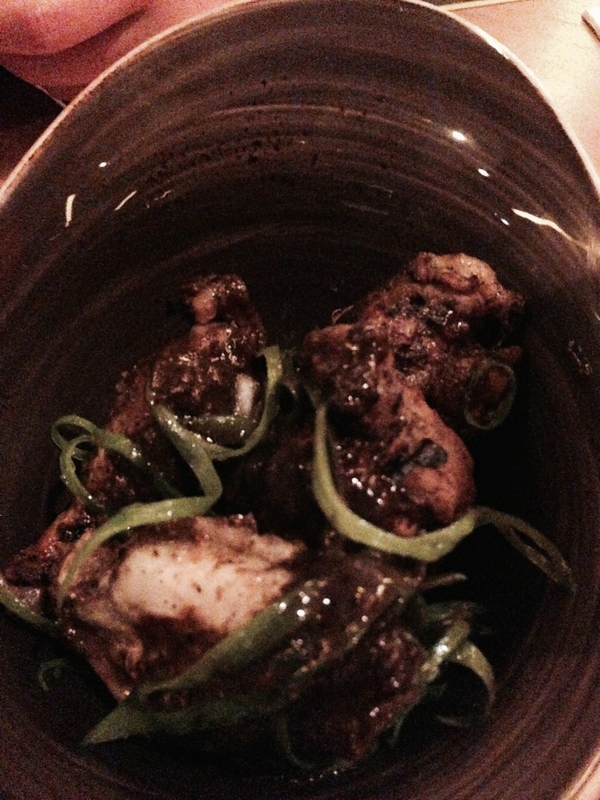 I had a taste of somebody else’s order – four smallish chicken wings – and we both agreed that they should have been marinated longer and cooked far more slowly. The seasoning was fine but nothing special. The house special, tongue and groove, was especially tasty: veal, grilled tongue, braised cheek and sweet potato puree. The fried chicken was at least well cooked but nothing remarkable. The special iced teas looked sensational (although I was drinking red wine myself): a generous helping measured out to slake three healthy thirsts. Our waitress was lovely. She checked our understanding of the menu and the drinks list without being obsequious; she helped with portion control and even gave fair warning about the size of the apple pie in case anybody needed to plan ahead. By the time we were leaving around 8.30pm, there wasn’t an empty seat in the house, so this is obviously filling some sort of void in the Melbourne scene. Was it worth a visit? Definitely. Was it worth a re-run? Not sure. I get a lot of the real thing at home in terms of home cooked soul food, so for me it’s not a huge novelty. But it would be tempting to head back one evening after work simply for a nice glass of McLaren Vale shiraz and a bowl of deep fried pig’s ears.